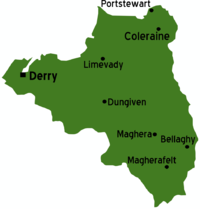 County Londonderry or County Derry is located in Northern Ireland. The name of the county is a point of political dispute, with unionists advocating the longer name, and nationalists advocating the shorter. A common attempt at compromise is to refer to the county as "Londonderry" and the city as "Derry", but this is not universally accepted. Derry has a 70% Roman Catholic majority. Avoid wearing clothes with Rangers or Celtic football embles on them. Also try and avoid wearing anything at all with a Union Jack flag (UK Flag) on it. The common language of Northern Ireland is English, however Irish maybe spoken in certain areas. It is not necessary to understand Irish to get by. It is best to be respective to both cultures (Nationalist and Unionist) in Londonderry, and it is wise not to refer to Londonderry as such in largely Nationalist areas, particularly at night - with simply Derry the preferred, safe term. By far the easiest way to Londonderry is by road access from throughout Ireland (Northern Ireland to the East and South) and the Republic Of Ireland (the near West - Donegal). There is also an international airport offering both seasonal and scheduled flights. There are frequent bus services from various locations throughout Ireland (see Bus Eireann) and there is also a less frequently used rail service from Belfast. This page was last edited on 20 January 2017, at 11:03.